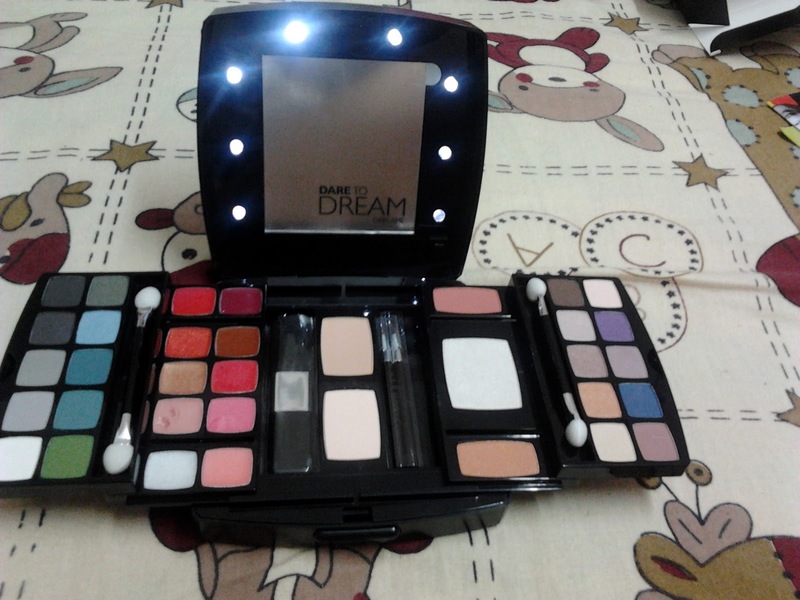 Review- Oriflame Dare to Dream Make Up palette | The Shopaholic Diaries - Indian Fashion, Shopping and Lifestyle Blog ! 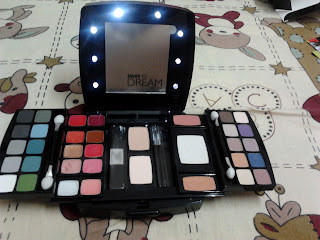 Last month I had purchased few cosmetics from Oriflame's catalogue, and 1 thing which I was looking forward to the most was- Dare to Dream Make up Palette !! And no doubt, I have been very happy with my purchase. 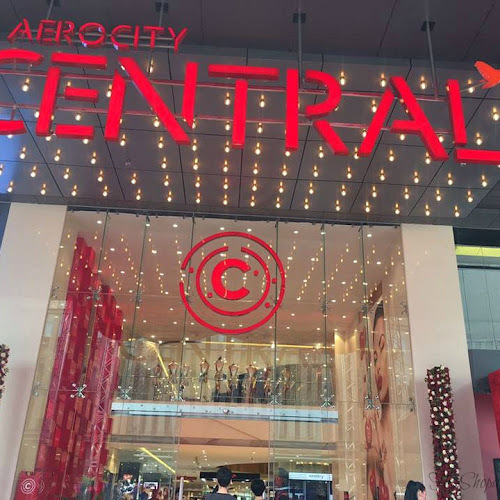 I wanted to post it about earlier but just got delayed coz of some or other reason, but Better late than Never, So here is the review which was lying in my drafts since last few weeks. I am sure you must have read about this Kit at some or other blog before, but still I wanted to post about my experience with it !! 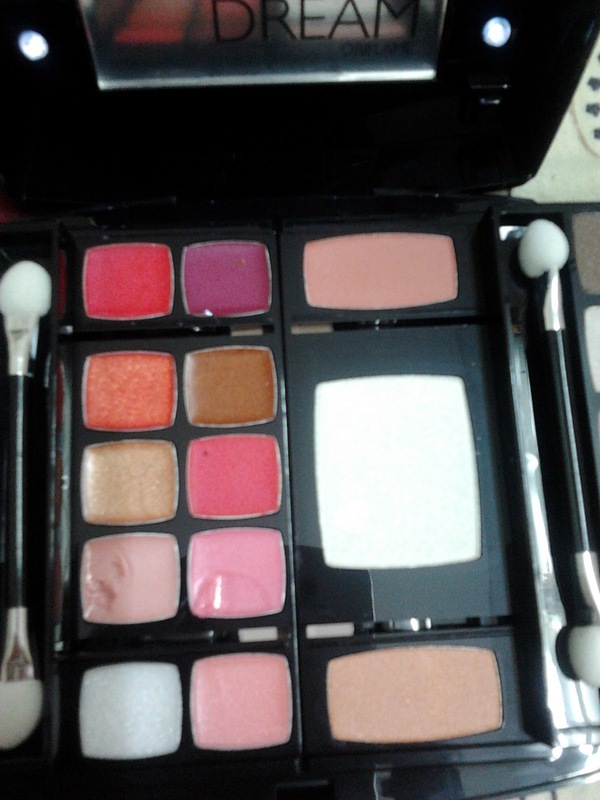 The Palette had come at a huge discount in the last flyer whereas originally it is priced at Rs 2490. Posh, chic, and glamorous! The Dare to Dream palette is an elegant compact palette that says it all. Featuring built-in lights to give you a backstage star feeling, this make-up palette is the preferred choice of professional makeup artist Jonas Wramell. 5 Applicators for easy application. 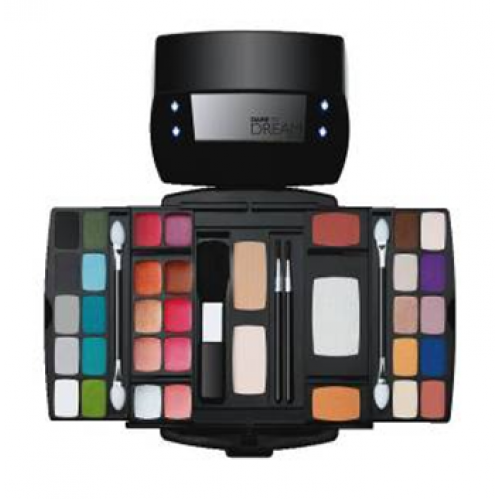 Dare to Dream with the best makeup palette ever from Oriflame. It came in a cute little black box, wrapped in a cover and the first thing one notices when we open the palette are the in-built lights at the front lid along the mirror- makes it looks soo Chic and stylish. The palette opens into 3 layers. The 1st layer has 20 eye shadows and 2 applicators. After sliding the top lids, there comes 5 lip glosses, 5 lip colors and a highlighter & 2 blushes. The bottom layer has 2 powders, blusher brush and 2 applicators. The lip colors are glide very easily on the lips and stay for 3-4 hours. The eye shadows are both in shimmer and matt shades. I am really happy with my purchase, because so far this is the best make up kit I have got at such a reasonable price ( It had costed me around Rs1200 in the Rakhi Flyer ) . Should you buy it or not?- In my views if you have previously used Oriflame products and are looking for a decent and reasonable Make up Kit - you should buy this kit, as it contains all the basic shades and things needed for a proper face Make up and also because Oriflame is a well known and trusted brand, you wouldn't be disappointed with the purchase. Have you tried this palette yet or are thinking of purchasing it? 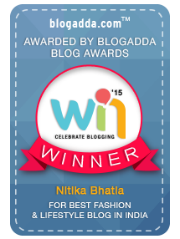 Share your views below, would love to read your comments !! Mumbai is India's monetary and money-making capital. It is a metropolitan town of entrepreneurs, business houses, nightlife and the famous game in India that is cricket. It is also home to India's extremely well-liked Hindi film industry. So you could manage a comfortable trip to the beautiful land by taking any of the numerous Flights to Mumbai that moves all year long. 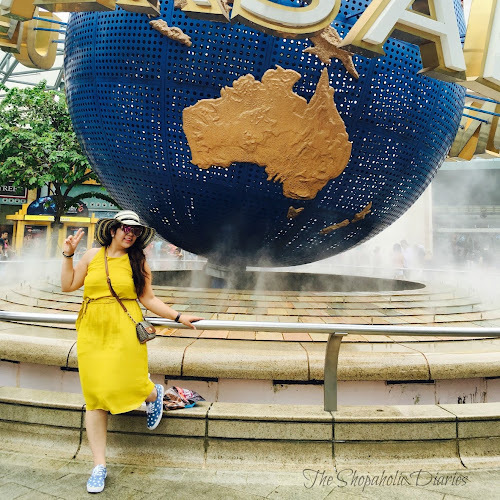 So catch hold of the Cheap Flights to Mumbai, and go there to rejoice the colors, essence and quality of a destination so exceptional and lively. 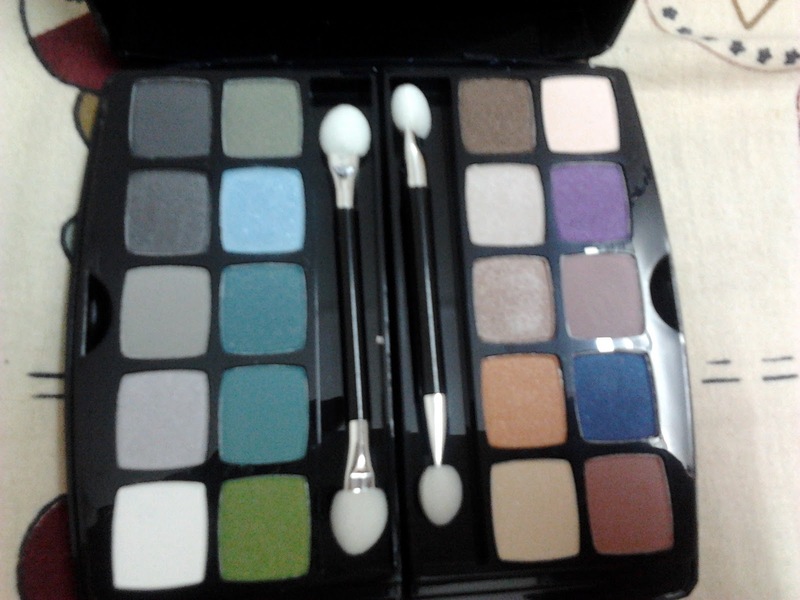 Well I have never bought any kit except the eye shadow combos but it looks good and can be bough. to disable right click, i'll send you the info on FB msg. I think that will be better. 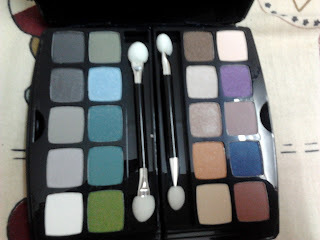 hmmmmm, i hav nvr had any palette cant wait to buy one!!! we suggest you to also try Avon products as they are of equally good quality at reasonable than Oriflame counterparts. We will continue to bring more cosmetics at better prices. Thanks again. Hey please contact me if you want anything from oriflame. 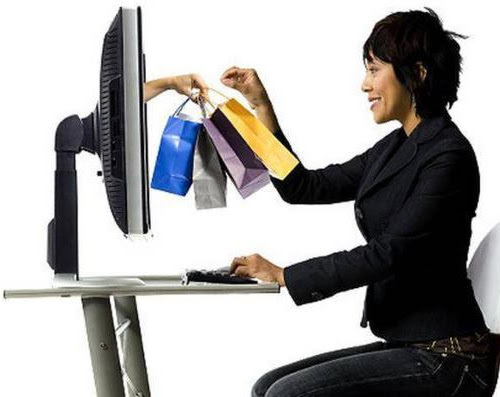 Just drop in an email at buyoriflame.sf@gmail.com or like my page http://www.facebook.com/oriflamedelhiindia :) Hope to hear from you. It seems a nice make up kit. Yes, you can call it makeup kit. I have used Oriflame products before and I am quite satisfied from them. Thanks for review. I have this palette and i absolutely love it! It's the main products i use for my makeup and it looks great every time! Thanks for the post. The product seems to be really amazing. You can also take help from the products of other brands and the stylists can help you in getting best looks for nay special occasions and if you are a girl then it is must as girls are born to be fashionable and look great.